Next Tuesday, July 22, 2010 the Bartlett Village Board will consider a private request to close Main Street on Saturday, September 4 at 11 a.m. until Sunday, September 5 at 12:30 a.m. for a “street dance.” In our view, the denial should require very little discussion and be unanimous. Making the request is the Bartlett Volunteer Fire Department (BVFD), which owns the well-worn building directly to the north of Village Hall. Before proceeding here, a few facts should be known to our readership. Once upon a time, the BVFD served a legitimate function in our village—prior to the establishment of a professional, full-time fire district. The building and the many good men and women who worked and played there over the years have become the stuff of legend, as well as sentimental favorites to many long-time residents. Rightly so. Those days, however, are long passed. Today, the BVFD has no affiliation whatsoever with the Bartlett Fire Protection District. Indeed, the last decade has been marked by open hostility from the District toward the BVFD, due, in part, to the latter’s refusal to change its name and put an end to the confusion as to its role in genuine fire protection. Though the BVFD maintains a tax-exempt 501(c)(3) status from the IRS, it does so under the defunct claim that it “is organized to help fund training, education & equipment for volunteer, combination & other fire, rescue and emergency services; to support fire education…[to] maintain building used for engines, trucks, other vehicles and equipment utilized for fire, rescue and emergency services.” This statement comes verbatim from the BVFD’s last filed IRS form 990-EZ, and it is patently false in all respects. What charitable work, then, does the tax-exempt BVFD do if it does not support the real fire department? According to that same 990-EZ, the BVFD claimed $41,963 in expenses. It looks like roughly $10,000 was spent on last year’s street dance. Another $1,200 was spent on members’ private holiday party. Another $1,045 went for meeting expenses (beer? ), another $1,431 for “membership items,” and, of course, more than $3,000 in “miscellaneous” expenses. In fact, the BVFD has devolved into nothing more than fully stocked bar in service of a private drinking club that masquerades as a charitable organization. Well, it is a little more, if you’re willing to dig even deeper. Then you’ll learn that the so-called charity has for years been a plaything for the most corrosive politician in town: Brian McGuire. No need to take our word for it, have a look at a recent photo (at the bottom) of the interior of the BVFD building, from which McGuire apparently runs portions of his political campaigns. 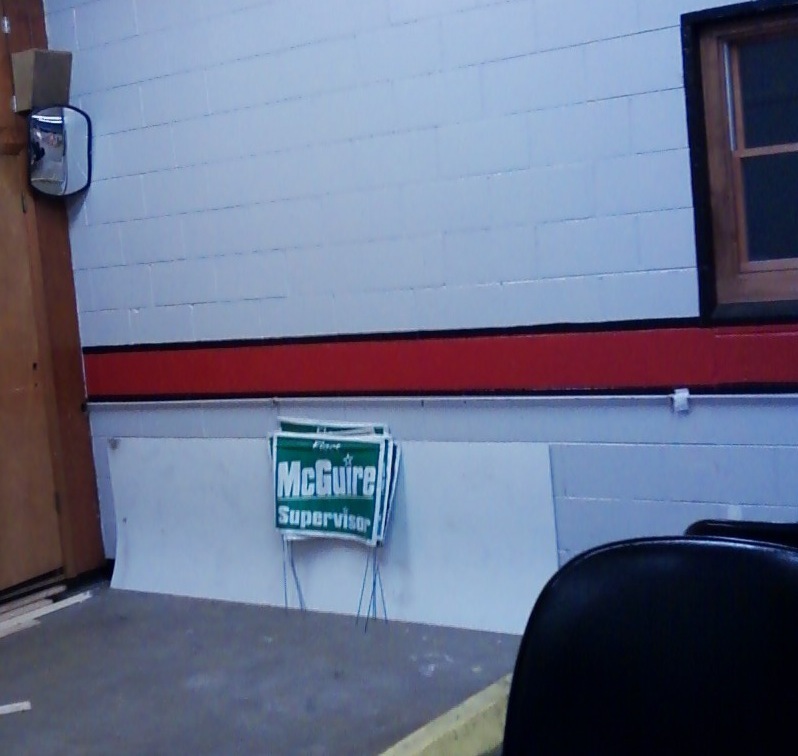 This is the same McGuire listed on that same 990-EZ as 2nd Vice-President of the BVFD. The same 990-EZ submitted to the IRS—under oath—denying that “the organization engage[d] in direct or indirect political campaign activities on behalf of…candidates for public office.” What an insult to the many good and true charities in town. With that understanding, we cannot conceive of a reason to close down the Village’s main street and sidewalks for an entire Saturday, thereby cutting off customers from all the businesses struggling to survive along the railroad tracks, down Main Street, up Oak Avenue, and in Bartlett Plaza. Much less to provide the dubious BVFD with free police security and use of the Village’s parking lot during government business hours. If the BVFD’s parties have outgrown their facilities, they should rent the Oak Room from the Park District or Bartlett Hills from the Village—same as anyone else must. They should not, with the blessing of the Village Board, have their party subsidized by tax dollars and be given special treatment at the expense of local business.